On 22 December 2017, President Trump signed the tax bill into law. At $1.5 trillion over ten years, Citi analysts expect the bill to provide modest late-cycle economic stimulus. The most important feature is a reduction in the corporate tax rate to 21% from 35%. Businesses should also benefit from accelerated depreciation of new investments, lower taxes on pass through income and a modified territorial tax system for multinational companies where firms are taxed based on where they generate business. 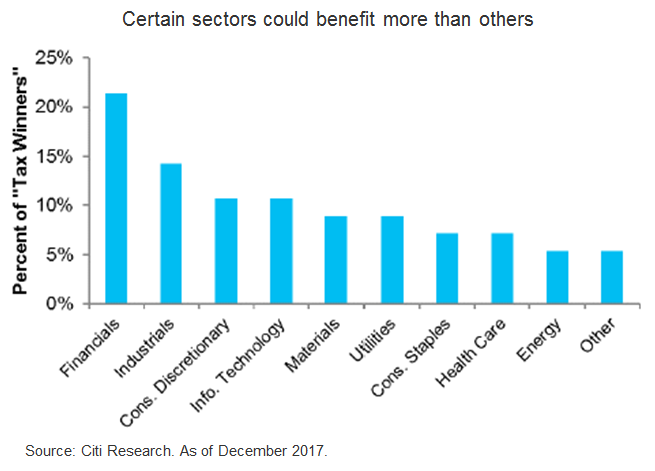 Here, Citi analysts look at the sectors that could potentially benefit. Financials: US equity markets should benefit from dividends, share repurchases and increased M&A resulting from lower taxes and repatriated profits. Demand for wealth management services could see a lift from lower tax rates. Domestic banks may pay lower corporate tax rates but lower interest-expense deductions reduce the incentives to borrow. Industrials: A large number of companies should benefit from the lower corporate tax rate and a reduction in levies for repatriating overseas profits. Non-core assets could be freed up for M&A at conglomerates. Truckers and airlines may be able to upgrade their fleets with more fuel efficient vehicles and could see more volume from firms relocating select operations back to the US. Construction firms could benefit from private-activity bond (PAB) financing in the final bill to support future infrastructure investments in schools and hospitals. Consumer Discretionary: Retailers in US sales pay relatively high taxes. A higher standard deduction helps brands targeting lower-to-middle class shoppers while the lower top tax rate helps luxury brands. Citi analysts note that the impact of tax reforms have been largely priced in as potential tax cut winners have outperformed since the US Presidential Election and especially since late September when tax cuts moved to the top of the fiscal policy agenda.